(Newser) – Divers frightened away by the many deaths at the wreck site of the SS Andrea Doria—16 people have lost their lives trying to explore it—can soon see what slumbers off Massachusetts another, safer way. Beginning June 2, ocean exploration company OceanGate plans to send a manned submersible to explore the spot, 60 nautical miles southeast of Nantucket. 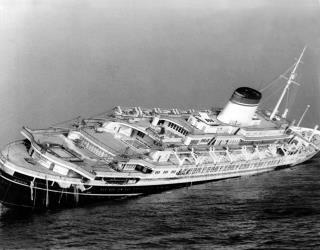 The Italian luxury liner sank there after colliding with the MS Stockholm on July 25, 1956. For six hours a day during the week-long mission, the Cyclops I will survey "the premier shipwreck in American waters," take high-definition video, and use sonar imaging "to create a very accurate digital map," OceanGate CEO Stockton Rush tells the AP and Boston Globe. The Globe explains "no diver has been able to piece together a comprehensive picture" of what remains, in part due to poor visibility. Here's one that I'm sure divers must know, please tell me they know this. Ok, its the last day of a vacation for this guy. He decides to splurge on a scuba dive. Its 25 to 50 feet. He did the dive in the afternoon as the wife had checked out the kids and got them to the airport for an evening flight. He finished his dive and got himself to the airport having checked in all his rental gear. He goes through security fine and they are on the flight just a few hours later. He's now 35,000 feet in the air and all of the sudden goes into a raging seizure. He forms horrible red rashes on his whole body. He completely loses his hearing. The pilot considers an emergency landing except that Miami is their next stop and connecting flight so he decides to stay on course. Well the EMT's meet him at the gate and they take him away. He was later diagnosed with a near fatal case of bends. Wife rents a car and they drive home. He then visits our facility to take a dive once a day for a week in the big steel tank. He only got his hearing back about a month later. The takeaway, don't dive on your last day ahead of a flight. I was 10 when that happened, and one of my classmates and his Italian mother went to Italy on the Andrea Doria, and on the return voyage the Stockholm hit it. Thankfully my friend and his mom were still in Italy. Yes fishing nets go that deep and deeper. Most of the lost divers were lost doing penetrations into the wreck - including one diver that on knew. Divers know how the deal with nets. My qualifications - 30 years as a diving instructor, 20 of which were diving off the North East coast.